Baghdad, October 2015 In a fast changing medical field such as dentistry, it is essential to stay on top of new developments in order to ensure a thorough education for future dentists and improve treatment facilities. 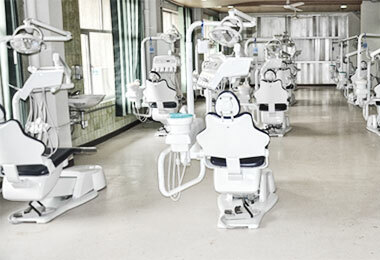 For this reason, Karl Kolb was contracted to support the College of Dentistry of Baghdad University in their modernization process by supplying various devices, such as dental chairs, prosthetic and simulation systems and imaging instruments to their departments. As a result of an exemplary team effort by Karl Kolb staff, 156 brand new high-quality dental chair units were supplied and commissioned to the Educational Clinics and Clinical Training Laboratories. They are successfully being used right now to educate students and to treat patients. Additionally, the Crowns & Bridges Clinic received state of the art CAD / CAM prosthetic systems. Further set up of instruments is ongoing in the other departments of the College of Dentistry at the University of Baghdad. Furthermore, Karl Kolb engineers and application specialists trained the end users on appropriate use of equipment. After-sales support will continue on a regular basis through frequent visits. This in turn ensures fast troubleshooting in application issues and maintenance requirements.